Abdul Hay Mosallam Zarara is a self-taught Palestinian artist who has meticulously worked on archiving the recent histories of the Palestinian people. He was born in 1933 at Al-Dawayima in Palestine, and currently lives and works in Amman. Mosallam recreates scenes from daily life in his lost Palestinian home that have remained vivid in his mind since his expulsion from the village of Al-Dawayima in 1948. 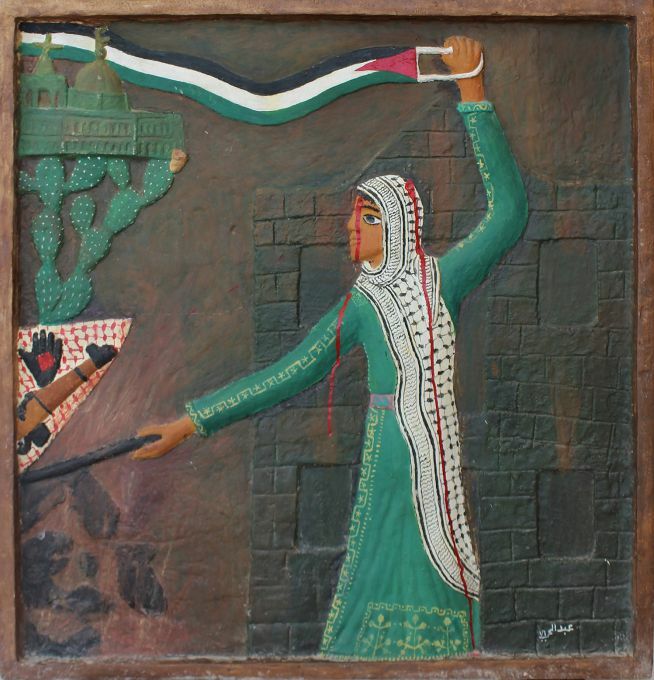 Mosallam has also produced extensive documentation of the recent Palestinian struggle and liberation movements in the form of painted reliefs – it is these works that form the basis of the exhibition in Sharjah. The extract on show forms part of a “painted archive” – a unique representation of a community writing its own history. Like all his work, the pieces on show at the Sharjah Art Foundation till 15 January 2015 are highly illustrative. Mosallam did not have any formal training, using sawdust and glue to construct the reliefs. Is his early works, Mosallam recalls village scenes, elaborate with details of traditions and celebrations, everyday life in Palestine – village weddings, Ramadan nights, gatherings, farmers and traditional dancers, all vividly painted on reliefs and inscribed with traditional songs and poems. Later, Mosallam worked while living in exile and in refugee camps, at first in Lebanon and later in Syria. In 1982, when Beirut was under siege, he succeeded in putting on an exhibition in the midst of city ruins. His works during that period were linked with the feelings and needs of the people who were sharing the struggles of that time and place with him. Through his work he hoped to strengthen the resistance of a people struggling on every level to survive. Woman are used as symbols of power , presenting their men with a reason for living. At the foot of a palm tree, a man is shown playing music for his lover, in another work the woman is depicted as a boat, naked and with long hair, transporting the man. The woman always appears stronger than the man, inciting people to go against the current and challenging the subordinate role of women in the Arab world. The works on show are darker, consumed with battle scenes and political messaging. FN is looking forward to a second visit to get some more images of the works on show added to this article. Mosallam use of simple tools and materials is in line with the sparseness of his life as an exile and fighter. In 1986, a film title Gold Dust, was made by Mohammad Mawas on his works. FN has struggled to find it, but the title of the film points to the contrasts between the poverty of the raw materials and the value of their transformation in the artist’s work. Reblogged this on Seehive's Blog.